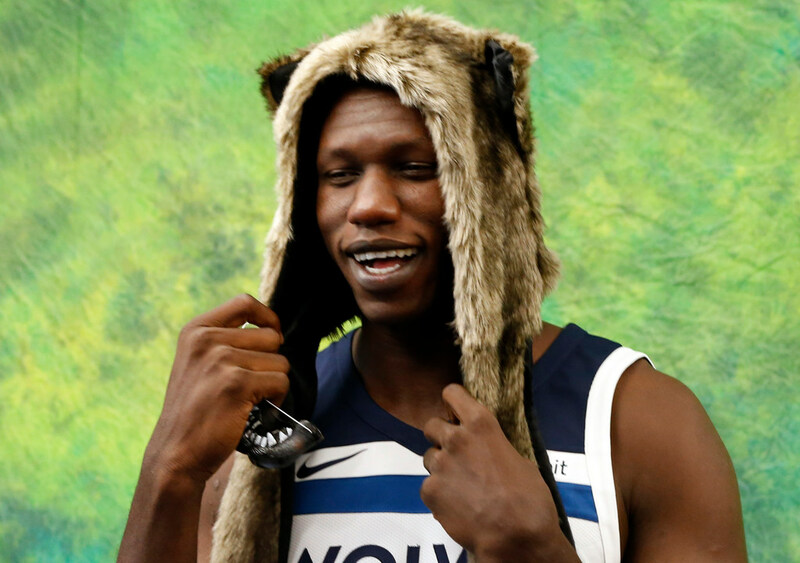 The Timberwolves’ offseason makeover is playing out as a predictable work in progress on the court as we sort through the pluses and minuses of everything that happened. There are big-picture questions like how much Jimmy Butler (when he’s not sick) will help this team grow, whether ditching Ricky Rubio in favor of Jeff Teague was a good idea and just what the ceiling is for young scorers Karl-Anthony Towns and Andrew Wiggins. But there are also some lower-level questions that might be more significant than we think. One of them has to do with the playing time of Wolves big man Gorgui Dieng. Dieng agreed to a four-year, $64 million contract last October — a deal that started this season. He had a typically solid and durable season in 2016-17, averaging 10 points and 8 rebounds while starting all 82 games. He played 32.4 minutes per game — a slight bump from the 27-30 he had played the previous two years, when his minutes fluctuated between the starting lineup and the bench. Dieng also continued to be an advanced stats darling. He was third on the team in wins shares behind Karl-Anthony Towns and Rubio and he was second behind Towns in VORP (value over replacement player). Of Wolves players who played at least 1,000 minutes last season, Dieng had the best defensive plus-minus rating. Among the 60 NBA players classified as centers last season, Dieng ranked sixth in that category. Karl-Anthony Towns, also considered a center, was dead last — 60th out of 60. Clearly one functioned more as a power forward, and the swapped roles at times, but the implication is clear: Dieng does a lot of little things, especially on defense, that help a team. That said, he did all those things on a 31-win team. The Wolves, in making a push to improve significantly this offseason, added power forward Taj Gibson on a two-year, $28 million deal. Gibson has the benefit of coach Tom Thibodeau’s trust from their Chicago days together. He also has the versatility to guard more positions and switch on defense. Gibson was inserted into the starting lineup to start this year, with Dieng heading to the bench. ( (Gibson, by the way, was 13th among power forwards in defensive plus-minus last year — certainly no slouch). Gibson has hardly been bad — he was quite good, in fact, in the Wolves’ 115-113 win over Oklahoma City, registering a double-double while being a plus-21. In the Wolves’ three losses, though, Gibson has been a minus-38. The problem, though, has less to do with what Gibson is providing and more to do with Dieng’s early role. With Nemanja Bjelica also gobbling up power forward minutes, Dieng has more or less been a backup center so far. He’s averaging just under 14 minutes per game — less than half of what he had come to expect over the past three seasons. He’s looked lost at times as the Wolves sort out their rotations, though his per 100 possession averages are in line with his career numbers. Dieng will never be a smooth player. He can often look awkward and mechanical, particularly on offense. But he’s also effective. Adding quality players should make a team better, but if it comes at the expense of playing time for other quality players, is there really any gain? At the very least, how Dieng fits into this roster is another evolving question in a season full of them for the Wolves.